350ci and 400ci MFP’s – Virtually unbeatable in terms of speed, colour quality, ease of use and flexibility – whilst also having a small footprint! An A4 machine that can print – copy – scan – staple and send. Allowing you to create complex print jobs quickly and efficiently. With a maximum resolution of 1,200 dpi and the option to process different media with weights of up to 220g/m there is no compromise on high quality colour. The device can automatically punch holes and staple your documents. 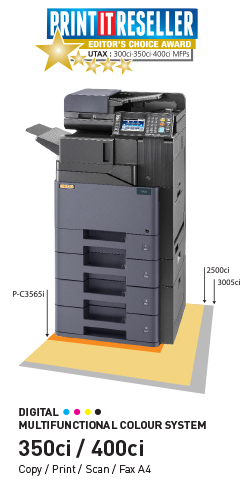 If space is an issue for your office take a look at our compact 350ci and 400ci MFP’s – Print 35 or 40 pages per minute and scan at high speed.